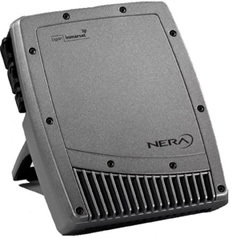 The Inmarsat BGAN Thrane & Thrane EXPLORER 100 (former Nera WorldPro 1000) terminal combines an exceptionally compact design with performance and optimal flexibility. The terminal can be separated into two parts, so users can choose between indoor and outdoor use, with no need for a separate external antenna. Combined with a handset for voice telephony, it is ideal for single users who need to set up a complete broadband mobile office in frequently changing locations.